Not all boxers who win world titles are born stars. Those are just a handful compared to the number of athletes that try their luck in this sport since it’s begginings. Not every fighter is Oscar De La Hoya or Sugar Ray Leonard. Some make it the hard way, the FIGHTER’S WAY. This is the case of Jesús Rojas. The boxer from Caguas, Puerto Rico had a good amateur run and began his professional phase with a significant streak of wins, most coming by knockout. His style is as aggressive as possible from the first bell. If you follow network boxing you must know middleweight titlist Gennady Golovkin. Jesús is a 122-pound Golovkin. He throws long hard punches to the body and head without going crazy. Just when it looked like big fights were coming, the young puertorican had a couple of situations out of the ring that led to his first loss. He won his next 5 fights and got a draw after that. Those factors made mexican superstar Jorge Arce sign to fight Jesús in las Vegas in 2012. Arce dropped Jesús in the first round but got battered immediately after that. The fight got stopped in the second round but got declared a no-contest by the referee citing a headbutt and a lowblow. After the Arce fight, Rojas went through personal and management problems including a split with his head trainer Evangelista Cotto. A year went by and even without any schedule fights, he continued to train, now under the mentorship of José García. Life paid off. He got signed by local promoter Universal Promotions and returned with a first-round knockout in Ponce, Puerto Rico last March. Three months later, two weeks ago, Jesús and his team traveled to Dominican Republic to fight undefeated Juan Carlos Peña. Until that day, June 28th, Peña had a record of 23-0 with 16 KOs. The bell rang and it was not a fight. Jesús battered the dominican prospect for 6 rounds. He wisely decided not to come out for the 7th. With his first big win Rojas was awarded the WBA FedeCentro Super Bantamweight Title and got a significant boost in the rankings of the division. Rojas is a real fighter. He is an athlete who has come up the real HARD way. It is impossible to predict when he will fight next but I sure hope it is soon. He has all the tools to become an icon among all sorts of fans. Puertorican boxers have chosen to be more safety-first in recent years but not Jesús. He will pressure and punish anyone and will not take a step back. Puerto Rico has a couple of good fighters coming up. The Arroyo twins(McWilliams and McJoe), Danny García, and Felix Verdejo get most of the media coverage right now and it is not fair that Jesús Rojas recently fought an undefeated prospect, at the guy’s hometown, made him quit after 6, and got no coverage. The fight was part of the WBA KO Drugs event and didn’t even get a mention in most boxing websites. Fighters like Jesús, who in my eyes will become a world champion in less than a year, are the ones that define the sport of boxing. A year ago he almost took a fight without getting paid a cent. He just wanted to get in the ring and get his career on track. His mentor José has succeed in bringing out his best, and added the elements of patience and science. Patience because he now has the ability to go a few hard rounds before getting the knockout. Science because he has now added a strict condition regimen to the equation(José García is a certified personal trainer). How would Jesús do against the champions at 122 and 126? He has all that’s necessary to beat any of the champions. Guillermo Rigondeaux is the best titlist at 122 but has age against him. With the work rate that Rojas brings he can make the cuban get into a fight, which is totally against his principles. At 126 I would make the Johnny Gonzalez fight in a heartbeat(Universal Promotions take note). It would make another great chapter in the Puerto Rico-Mexico rivalry. 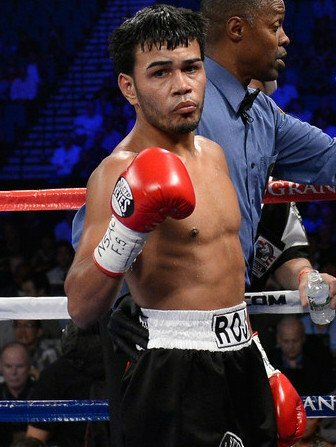 As a boxing fan and blogger I see Jesús Rojas as the next champion from Puerto Rico. The deciding factors here will probably be the willingness of other ranked boxers to fight Jesús. The next step should be to look for a name opponent. Jorge Arce should accept a rematch. If that falls through; Marvin Sonsona could be a good option. Anyway I’ve talked enough. To all the networks in the world that give boxing air time: It is time to give Jesús the space he has earned.